This is primarily a resource for the members of the Altar Guild. We are a group of dedicated parishioners who work behind the scenes caring for the sacred vessels and linens, securing the necessary articles to be used at every service, and cleaning the altar areas. We work reverently to support our worship at All Saints’ Chelmsford. We are in teams that have a bread baker. Teams are on duty for all services during a two week period. Rotation of teams changes on the Thursday before your Sunday. Funerals – We do not need to attend, just set up and break down. If communion, set up like an 8:00 service. If no communion, no candles on the altar. Advent – We need a work day after the Christ the King Sunday service. Four wreaths with blue bows need to be picked up from Tewskbury Florist on Rte 38. These wreaths are hung on the exterior doors of the church and chapel. Church Blue frontal, blue globe for sanctuary lamp. Greens not flowers. 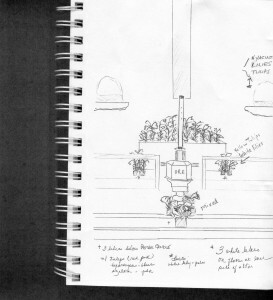 – The large metal advent wreath needs to come from the chapel sacristy to the pulley over the lectern. Candles for this wreath are stored in the sacristy candle cupboard. We usually use four blue and one white. – The felt Advent Calendar (and it’s extra dates bag) are stored above the men’s choir robes. The days have to be moved into position. Advent3 is the rose felt day. It has no numbers since the dates change, but it will always be on the 3rd Sunday. Put whatever day it replaces into the extra dates bag. Hang the advent calendar at the back of the church on one of the side walls. Put the roller , bag and extra dates bag above the upper cabinets in the sacristy. – Four white felt banners are stored in the robing room. They get hung, one per week, near the front on the side walls of the church. Bring them to the racks by the snuggery. Advent1 Regular setup for church, water the greens, Chapel Switch to blue. The small ceramic wreath comes out of the chapel sacristy closet and is placed on the round chapel table (used for chapel funerals for the cremanes) and put near the pulpit. Colored tapers should be in the bottom drawer where the frontals are kept. Ask Rite 13 or the lower church school to green it up. Set up the ceramic creche scene on the chest in the narthex. It is stored in the robing room. There are 2 cases of wreaths in the back room to replace the flowers and put on the windowsills. After Angel Tree ministry has finished, the Fontanini nativity set (stored in the bottom cabinet on the left in the sacristy) can be placed on the narthex table. No baby until eve. Lessons and Carols – Offertory but no communion. Bill prefers nothing on the altar if there is no communion. He wants different candles either on the table behind the altar or on stands. 5″ candles for the congregation used for Lesson & Carols and the 2 Christmas Eve services will need to be in large, flat baskets from the upper closet. Have them ready in the narthex. Advent4 – Add the full candle blue advent banner to back of the church opposite the advent calendar. Set aside poinsettias for Pastoral Care home visits if requested. Change from blue to white. Put the red globe back into the sanctuary lamp. Extra bread, heavy hand for wine. Assign clean up teams. Christmas 1 – Take down advent calendar, Roller and bag are stored on top of the upper cabinets in the sacristy. Send red poinsettias home with parishioners, keep white until Epiphany service. Epiphany – 7:00 PM service usually Church. Service of light, votive candles are provided by Maggie Marshall. White poinsettias only. Add wise men to nativity. Lent – Swap metal for ceramic, use squats, unleavened bread is great. Bare flower ledges or twigs. If twigs, must be movable for funerals. We can switch to pita bread if you want. Ash Wednesday – Ashes and wet paper towels ( provide a tray to protect the wood) to clean fingers needed for Wednesday noon in the Chapel and we alternate hosting the 7:00 pm service with Trinity Lutheran. Veil the crosses in purple. Sunday of the Passion: Palm Sunday – Palms are ordered by mail. They need to be transferred from the cardboard to the flower fridge. Leave them in the bags. When you set up put the palms for arranging into ice water while you get everything else done. Arrange the ledge display last. 8:00 needs a bag of palms in a low basket (stored in the upper closet) on the table in the narthex. Leave the bag sealed as the palms dry out quickly. 10:00 We start in the parish hall. Please set up a card table with red tablecloth (upper closet with the baskets we use for the palms). Veil processional cross in red. After the service discard the ledge arrangements. Blessed palms should be saved to be burned. Maundy Thursday – Foot washing and stripping of the altar. Set up as a regular 10:00 Eucharist in Lent. If we have a lot of consecrated wafers use them instead of bread. Attendance has been around 50. Good Friday – Altar remains bare, no kneelers. We provide 14 pillar candles for the Stations of the cross. Set them on pedestal stands from the upper closet and set the stands in the chancel so the candle can be extinguished from the back. There is black fabric in the bottom drawer if needed. Easter Vigil – Starts outside with a fire, moves into the Parish Hall then into the Church. Needs congregational candles, the longer tapers are preferred. Often included a baptism in the parish hall. Use the torches in stands in the PH. Service ends in the main church with communion. Challah bread is a nice touch. In Lent and Advent we use a red binder in place of the altar book. Since Lent 2015 we are veiling the processional cross. Purple through Lent, red veil for Palm Sunday, black for Good Friday. Piscina is FIXED!! We need to rinse the consecrated wine out of the pipe. Noon Chapel on Wednesday, sometimes doesn’t happen. Please check the calendar on the website. Please set up and drape the altar with the sheet to cover. We dot not have to check the length of taper or check snuffer for wax build-up. We will still give it a polish for Easter and Christmas. Usually some February Flowers in memory of David Willman, please check the schedule by the lower garden or ask Darlene. We have had some wonderful success with Zoots cleaning our fair linens. Thank you to Carol Douglas who has been bringing them over. The owner is a former All Saints’ parishioner and she has treated us well! If you have dry cleaning, please consider using Zoots as a thank you! In the Chapel please do not put out a baptismal towel. We do not use a lavabo so no towel should be provided. In the Chapel a small, wooden box has been provided for the non-wheat wafers. Just in case! Rev. Bill will take care of the microphone. It is no longer stored in the sacristy. Please check out the addition to our broom closet…hanging on the right side. New Gospel book stand for the chapel. Set up like the main Church (centered on the front edge of the altar). The veiled chalice sits directly behind it. 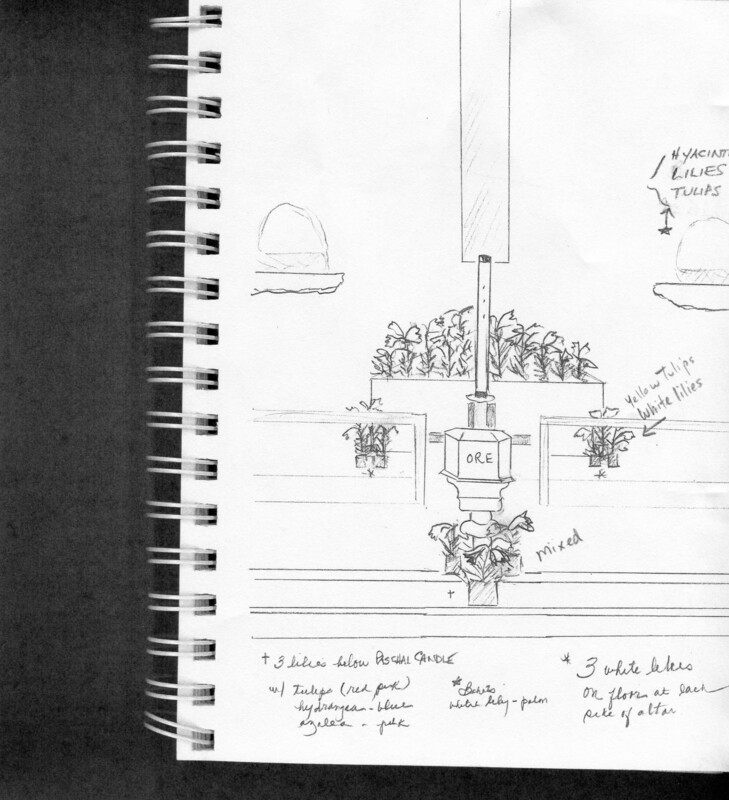 What is the difference between the tabernacle and an aumbry? On or near an altar there may be a receptacle. If this is on the altar it is known as a tabernacle. If set into the wall it is known as an aumbry. An aumbry is usually a small locked safe that contains the blessed sacrament – the consecrated bread from the Eucharist. It is reserved so that Holy Communion can be taken to the sick or shut-ins at short notice. The locked safe also contains holy oil that is used at baptisms and for the Sacrament of Holy Unction and the Laying On of Hands. Ceramic ciborium, would be nice to match the lavabo bowl Liz Landers made. Needle worker to repair a couple of kneelers. Welder to repair the advent wreath. Again. Thank you all for Easter!! !